Twenty-five miles south of St. Louis in the western part of the region, you’ll find the town of Valmeyer. Known for its innovative development opportunities, such as the Rock City Underground Business Complex, Valmeyer boasts of housing some of the largest and well-known businesses in the region. 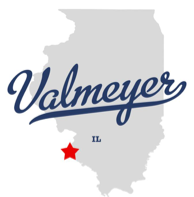 Founded in 1909 and located on the bluffs overlooking the Mississippi River, Valmeyer is home to brand new schools and a relaxing downtown area.